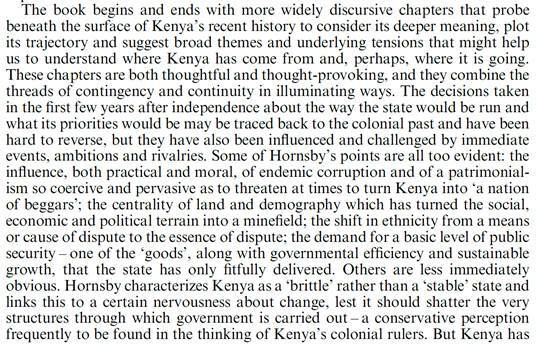 There have been many books, papers, monographs, and other scholarly works on Kenya�s history. Most of have �focused on the colonial era or on specific post-independence topics� (p.1). 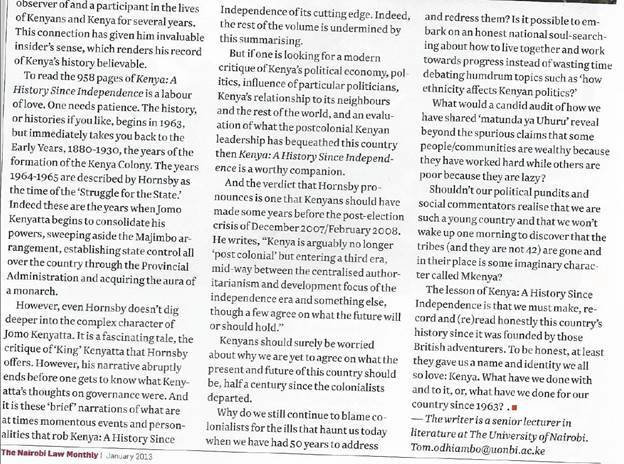 None has successfully treated the post-independent era of Kenya in its wholeness. This is exactly what Charles Hornsby has accomplished. As Kenya celebrates its fiftieth year of political independence in 2013, this book questions all the political paths that Kenya has taken since its independence in 1963. It does this by presenting a historical narrative of sequential and connected socioeconomic and political events. struggle for the state.� This chapter exposes pertinent issues relating to the country�s quest to stand as a nation (pp. 93-155). The fourth chapter describes the 1966-1969 period. It interestingly refers to this period as a time of �multi-party non-democratic system� (pp. 156-219). During this period, Kenyans witnessed undemocratic experiences in the country, despite that the government was considered a democratic one by the international community. During these years, state abolition, detentions without trial, restrictions on public meetings, and ethnic preferential policy treatments became a culture of the then government of Kenya. 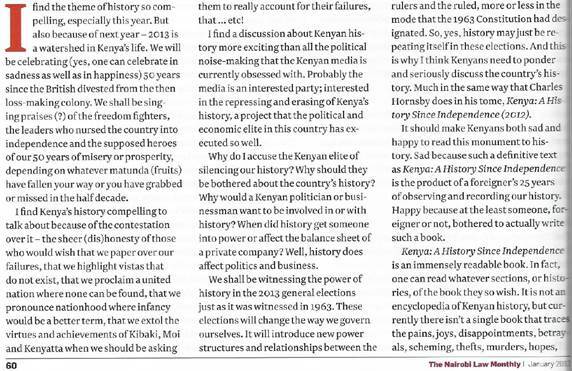 The fifth chapter describes the �golden years� of Kenya (pp. 220-278). This period, 1970-1974, was �when the growth and instability of the 1960s gave way to stability� (p. 220). The book reveals that hidden in this period was the �kikuyuisation of Kenya.� This was a period when �the state continued to talk of Kenya as one nation� but focused on �the entrenchment of Kikuyu power through its formal and informal networks� (p. 254). The sixth chapter exposes the �rigor mortis� period of 1975-1978 (pp. 279-330). This period saw crises along political, economic, sectoral, and regional lines. The seventh to thirteenth chapters chronicle the periods from 1978 to 2010. The author notes that a lot changed in many ways during these years. In the final chapter, the book notes that Kenya�s ��economy remains structured along colonial lines� up till today (p. 787). 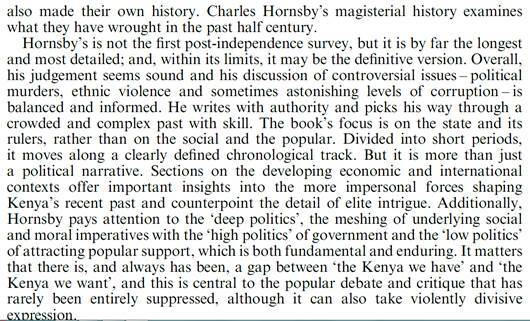 The author passed what could be a damning judgment on Kenyans�that �Kenya�s history is poorly understood by most Kenyans� (p. 787). How true is this statement? People may have divided opinions on this assertion. Only Kenyans and keen observers of Kenya would, maybe, have strong opinions on this assertion. 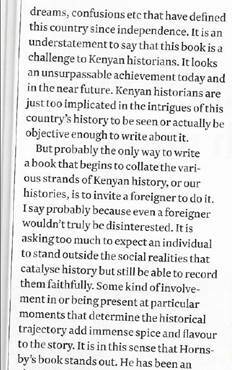 What the book has successfully done by making this assertion is to encourage Kenyans to study their own history better. From the diction and tone of the book, the author appears to have followed Kenya�s politics intensely and has authentic views on situations in the country. Without doubt, it presents an encyclopedic knowledge of post-independence Kenya with so much clarity that any researcher, historian, political scientist, and literary enthusiast would understand it. It gives compelling evidences that a minority of people own and drive the political vehicle of Kenya. It provides a historical orientation for understanding the Kenya�s 2007/2008 crisis. More so, it provides useful background for understanding the run-up to the highly contentious 2013 presidential elections. The book used authenticated documented evidences to support its message. Newspaper articles, books, journals and official government publications are some of the evidences the author used to back up his messages. The book includes detailed charts, graphs, maps, tables, photographs, and statistics about important aspects of the country�s history. This book is a must-read for all those interested in the general political evolution of African countries, in particular, Kenya. It will be captivating for readers who appreciate social and political history of nations. 1. Royal African Society at SOAS, with Dan Branch, 9 February 2012.